The first edition of the International Conference Series on Heritage Management Education and Practice took place in July 2017 with the key theme of ‘Exploring Connections across Disciplines and Stakeholders’. About 60 presentations featured in the conference as well as the plenary sessions explored the possibilities of connections across disciplines and stakeholders. The conference delegates representing 12 countries and diverse disciplines including architecture, conservation, history, cultural studies, museums, crafts, disaster risk management, and so on. In the upcoming 2018 conference, we seek to articulate and celebrate integrated approaches in both theories and practices. We would like to explore the gaps in our efforts of connecting disciplines and stakeholders, and suggest ways to bridge these gaps. 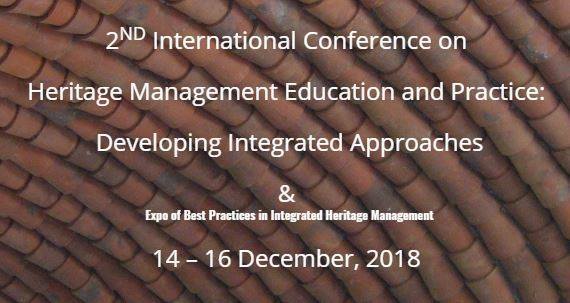 We called for abstracts reflecting on research, practices, pedagogy, and case studies on the successful stories as well as critical inquiries to highlight ways of integrating diverse aspects of heritage, diverse stakeholders, and bridging the gaps in heritage management practices.